In the first part of this three part blog, I looked at the concept of ‘enterprise regulatory change’ and considered whether regulatory change initiatives, at the enterprise level, are even achievable. In reality, the answer to this is “it depends”. When I first thought about enterprise regulatory change, I thought that the key to achieving a successful enterprise-wide initiative would purely be a function of the sophistication of the implementation model. But when you look at how it all comes together in practice, it’s clearly not so straightforward. In practice, there are going to be many other different factors that determine how a regulation can be implemented across one business area versus how it can be implemented across another. In practice, when you take into account the way in which each business area structures its data management or how each business area manages its trade processing or what accounting and valuation system each business area uses, for example, you start to realise that an enterprise-wide initiative for regulatory change might end up looking a tad ‘utopian’ in nature. And that’s really why “it depends”. So what models are there for implementing an enterprise-wide regulatory change initiative across multiple business lines and asset classes, or ‘silos’? 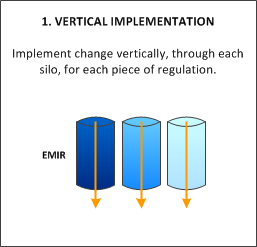 Regulations are mind-numbingly difficult to manage as it is, without having to introduce complex strategies to implement them, but with a bit of structure and process, it is possible to dramatically improve on efficiencies across the regulatory change programme and so reduce costs and time on the project. 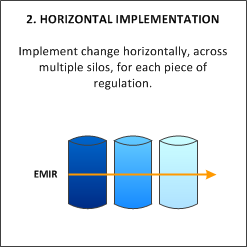 In the final part of this three part blog, I want to look at the practical realities of implementing regulatory change and what this might mean to an enterprise-wide initiative. 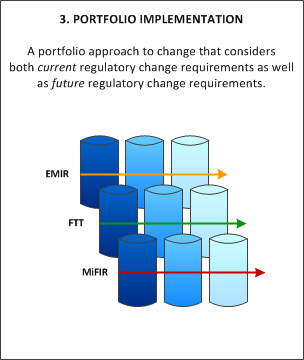 This entry was posted in Enterprise Regulatory Change, Regulatory Architecture, Regulatory Change by John Philpott. Bookmark the permalink.